Not a week after receiving a sample tub of Land O Lakes cinnamon sugar butter, I went to the refrigerator to see if there was enough left for the caramelized cinnamon apples I wanted to make with it. My husband and our two kids, breakfast by breakfast, had made their way through the whole tub that fast. They are no strangers to cinnamon sugar butter – it makes its way into their breakfast rotation quite often. They are big fans. Mike has his own little shaker of cinnamon sugar amidst the avalanche of bottles in my spice drawer, which he’s been mixing and refilling for some time. It’s been the height of convenience for him to have it already mixed into a spreadable butter. Or so I’m assuming, based on the evidence (or lack thereof). While the family has been spreading cinnamon sugar butter on their morning toast, I opted to try cooking with it. 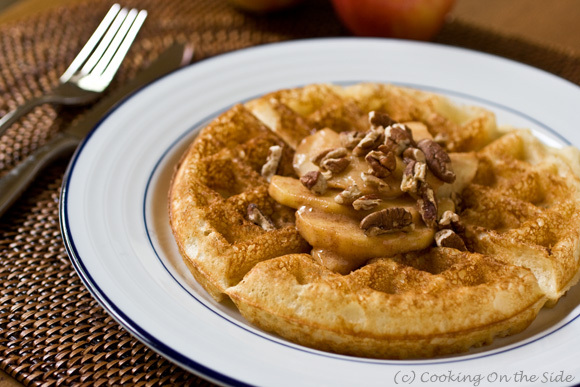 Read on for today’s Overnight Belgian Waffles with Caramelized Cinnamon Apples recipe and a chance to win a Waffle Skillet prize pack from Land O Lakes. The simplest and tastiest application I could think of for the cinnamon sugar butter was to caramelize some apples in it and pour them over some super-airy Belgian yeast waffles. The apples couldn’t have been any easier to toss together and the cinnamon caramel was just heavenly. These Belgian waffles, aside from their amazingly fluffy texture inside and crunchy exterior, are also a breeze to bake in the morning as most of the preparation (and it’s just a few steps) happens the night before. With a sprinkle of toasted pecans on top – well, it was like dessert for breakfast. Leave a comment on this post telling us your all-time favorite breakfast food. The giveaway will close this Friday, August 19, 2011 at noon PDT. [THE GIVEAWAY IS NOW CLOSED] I will use random.org to select one winner to receive the prize pack and announce the winner in this post. This giveaway is open to U.S. residents only. 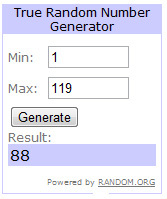 **UPDATED 8/20/11 – Congratulations to our winner, #88 Lynda Clark! Thanks to Land O Lakes for sponsoring today’s giveaway. This waffle recipe is adapted from the Good Night Waffles recipe in the Waring Pro Professional Belgian Waffle Maker recipe booklet. The caramelized cinnamon apples recipe is adapted from Dorie Greenspan’s Caramelized Apples recipe on Epicurious. The night before, or at least 8 hours before baking, combine the warm water, granulated sugar and yeast in a large bowl. Let stand 10 minutes, until foamy. Stir in the warm milk, melted butter and salt. Beat in the flour until smooth (this may be done using a hand mixer on low speed). Wrap the bowl tightly with plastic wrap and let stand over night (or for 8 hours) on the countertop; do not refrigerate. About 30 minutes before you’re ready to make the waffles, melt the cinnamon sugar butter in large skillet over medium heat. Add the apples and cook them until they are are brown and tender and juices form, about 10 minutes. When you’re ready to bake, preheat a Belgian waffle maker to your preferred setting. While the waffle maker is heating, stir the eggs, vanilla and baking soda into the batter. 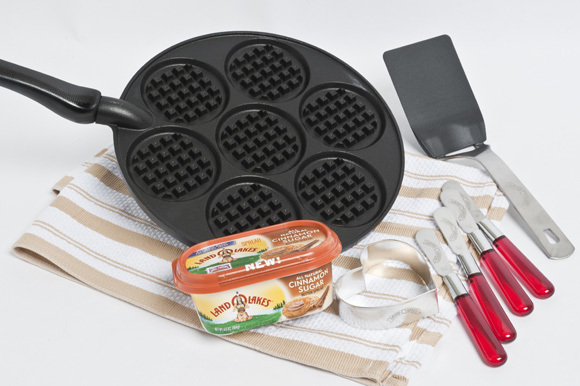 Measure out the batter and bake the waffles according to the manufacturer’s instructions for your waffle maker. Waffles may be kept warm in a slow (200°F) oven. Arrange the waffles on a cookie sheet on a rack in the oven. 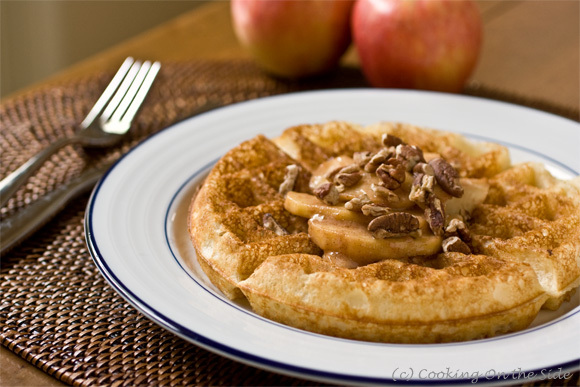 Serve warm, topped with caramelized cinnamon apples and toasted pecans. * Alternatively, to create your own cinnamon butter, combine 3 tablespoons of softened unsalted butter, 2 tablespoons granulated sugar, 1 1/2 teaspoons cinnamon and a pinch of salt. Follow your feed via RSS! My Mom’s (she is 89 and still great!) homemade scones fried with honey and butter!YUM! I also love Cream of Wheat (comfort food from my childhood) and Bob Evans home fries. But eggs are my favorite. I forgot to mention, I’m also a fan of facebook. Fav breakfast food is fluffy waffles – chocolate chips are a total bonus! I love ham, cheese, and veggie omelets. Yummy. Waffles actually ARE my all-time favourite breakfast food! Honestly! I just updated this post with the winner – thanks!